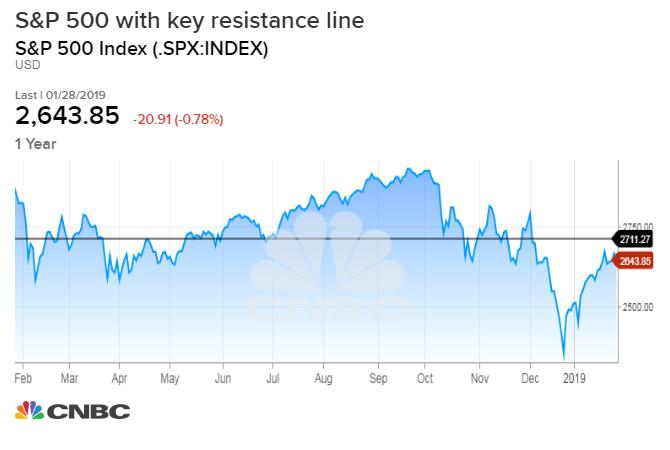 For investors pondering if January’s comeback is a revival of the bull market or just a bounce before the coming bear, the market is about to tell them, according to J.P. Morgan’s chart analyst. The market is still not out of the woods yet even after the S&P 500 rebounded from its worst December since 1931, posting a more than 5 percent gain in just four weeks of the new year. The benchmark is up more than 12 percent from its Christmas Eve low when it dipped into a bear market on an intraday basis.